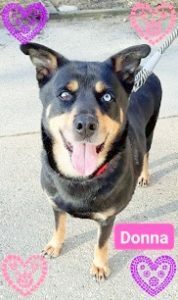 Meet DONNA, DONNA- Not a Prima Donna…..
DONNA a darling 4 yr old Shepherd/ Husky/ Collie painted in Dobie/Rottie black & tan was turned into Hempstead Town Shelter because her former owners moved closer to their elderly parents, but into a place that doesn’t allow dogs. DONNA is a sweetheart who thinks every person is her pal & doesn’t hesitate to show her belly. She has one blue eye & one blue/brown eye like a blue merle Collie. And she responds well when offered treats. DONNA has the makings of a lovely family dog. Meet this Beauty at Last Hope in Wantagh.